I’ve never won an award, nor have I ever given one out, but I’d like to do so today. 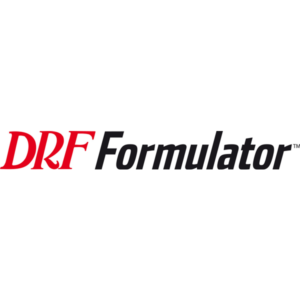 There’s a 13-year-old kid out there named Dylan Kerkhoff, who, along with his parents, Mendi and Vaughn, are hereby confirmed to be horse racing’s biggest fans. A year or so ago, I noticed a little fellow popping up in pictures at different racetracks. 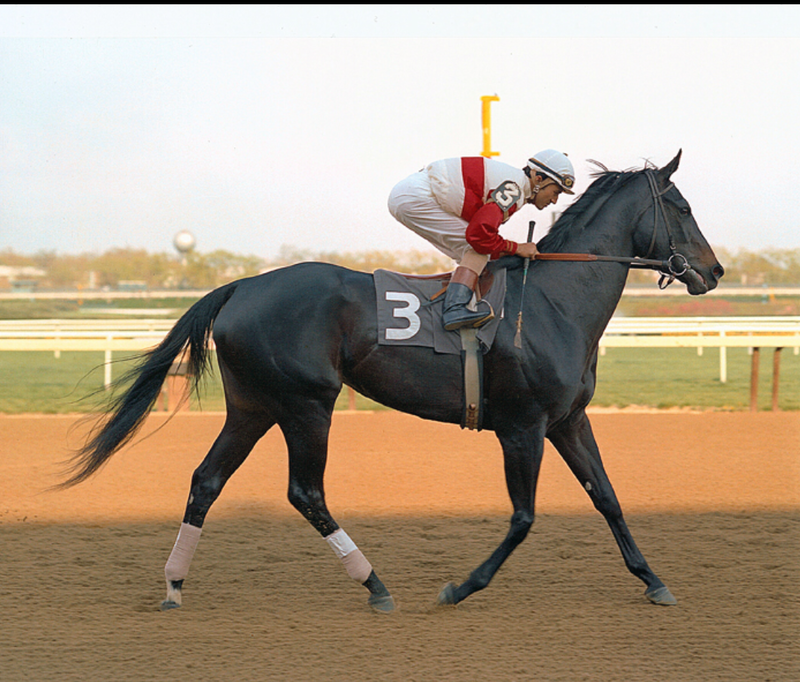 He was in photos with jockeys, he was in the winner’s circle, he was in the paddock and even in the announcer’s booth. The kid was just about everywhere and he seemed to always have the same Woody (from Toy Story) shirt on. Who was this kid and how did he get there? 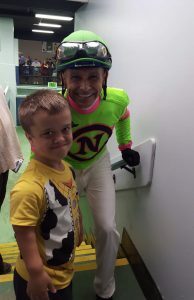 With my curiosity peaked, I started asking some of my jockey friends about this boy, and they put me in touch with his mom, Mendi. It turned out to be a great story about a beautiful family and brought to light some real stars in our racing community. 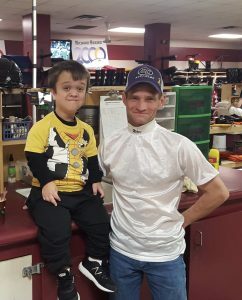 Some might say this is a dark and cloudy time in our sport but this story is a beam of sunshine that just might brighten your day. The family moved to Oklahoma when Dylan was about two-years-old, to be near Mendi’s parents and they’d attend Will Rogers Downs regularly, and Oaklawn and Remington a few times a year. 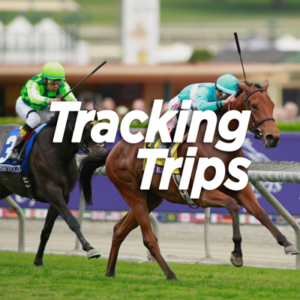 The family would also go back to California to visit their old haunts and while there, they’d hit Santa Anita, Los Alamitos, Del Mar, Fairplex and just about any farmer’s field that looked anything like a racetrack or had horses. Dylan’s parents have taken him to about 22 different tracks in the U.S. and have spent most of their adult lives driving around in a car to put a smile on their boy’s face. 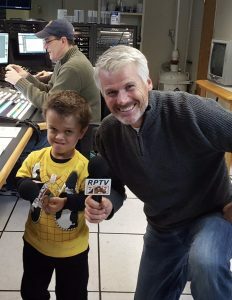 Dylan is a little person who has a common form of dwarfism called achondroplasia. He’s also borderline autistic with sensory issues and is mostly non-verbal. He’s uncomfortable around crowds and his social skills are few. But his parents discovered that when Dylan entered the racetrack and came eye-to-eye with the horses and noticed other little fellows riding these beautiful creatures, he was perfectly in his element. He became a social butterfly of sorts, often presenting a huge smile and a big thumbs up, while allowing jockeys to put an arm around his shoulder or even give him a hug. His social skills improved tremendously and he started to mimic track announcers and pronounce jockey’s names. The racetrack has turned out to be Dylan’s happy place and one can only imagine the immense joy absorbed by his parents at their discovery.The track is the only place he is more outgoing and seeks out interaction from others. 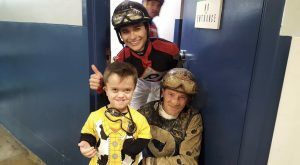 At the conclusion of Remington’s meet last December, the jockey’s and racetrack staff presented Dylan with an award of sorts. It was a large picture of the starting gate with a full field breaking from the line, and it was signed by about 30 riders and track staff. The presentation was given by jockey Alex Birzer, who had to hold back tears through the ceremony and begged Mendi not to cry either during the speech. But Alex’s efforts to bypass the tears were unsuccessful. “We had no idea all the jockeys and most of the staff were going to come down and do a presentation. It made us all cry. For them to take the time out of the races, to get the picture together and sign it, it just meant the world to all of us and we can’t thank everyone enough,” Mendi said. 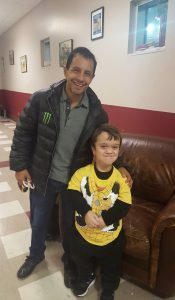 Besides Dylan’s buddies at Remington and Oaklawn, he’s also met Mike Smith, Johnny Velazquez and spent time with Victor Espinoza. 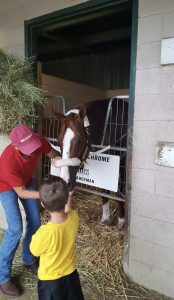 He’s rode in the starting gate at Hoosier Park, met American Pharoah and fed cookies to California Chrome. 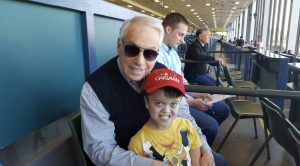 Dylan had a race at Churchill Downs named after him in honor of his 13th birthday and he’s spent time in the announcer’s booth with Dale Day, Ed Burgart, John G. Dooley, Vic Stauffer, and Pete Aiello. He’s been seen in the winner’s circle at most tracks and I doubt there’s a jockey that ever turned him down for a picture. There are far too many people to thank individually for brightening Dylan’s days at the racetrack, but you all know who you are. This pure gift of human compassion showed no boundaries as it trickled from racetrack management, announcers, owners, trainers and jockeys, all the way down to hot walkers, parking attendants and vendors. The unselfish acts of our racing community shines like a bright light during a cloudy time in our sport. “There are many times my husband and I say how we can’t believe some of the things Dylan has gotten to do and how overwhelming it is for us to see the love and support Dylan gets from the entire racing community,” Mendi told me. Mendi and Vaughn Kerkhoff have gone above and beyond to provide a fun and loving world for their son. They have no problem with their never-ending road trips because Dylan loves it. “Some people take their kids to Disneyworld, but our family would much rather spend the day at the racetrack,” Mendi said with a smile. 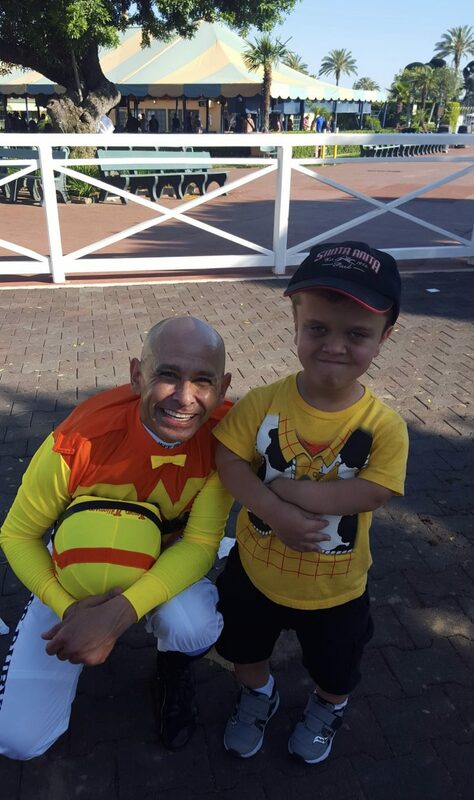 Dylan and his parents are true ambassadors of horse racing as well as our sport’s number one fans. The people involved in making the Kerkhoff’s day a bit easier also have my respect and admiration, as good deeds always seem to have a way of being contagious. 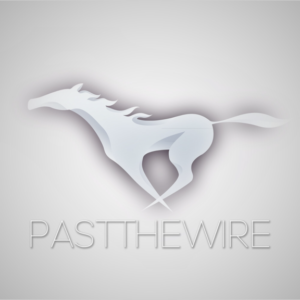 Horse racing is still alive, and very well these days in America’s heartland. You can follow Dylan’s adventures on twitter #wheresthewoodytshirt @woody_tshirt. (In loving memory of Uncle Dino Kerkhoff).